Michaela Franz initially thought she was spared sharp rent hikes when her new property owner scrapped plans to renovate the Berlin building she has lived in for a decade. Tens of thousands of people are poised to join marches against Mietwahnsinn, or "rental insanity", in Germany on Saturday. Housing rental prices have risen sharply in the country in recent years. PROPERTY NEWS - In fact, something worse was brewing. A few days later, she received a letter notifying her that her rental contract had been terminated and that she would have to move out by the end of May. For the 58-year-old, the landlord’s intention was clear: kick out long-time tenants and build new luxury apartments that fetch higher rents. Not only in Berlin, but across Germany, Franz’s experience has been playing out. And the wave of gentrification and rising rents is provoking rising anger and leading some to even ponder radical solutions like expropriating housing from institutional landlords. Tens of thousands of people are poised to join marches against “rental insanity” (Mietwahnsinn) on Saturday in cities like Munich, Cologne and Frankfurt. The problem is most acute in the capital, where rents have doubled over the past decade, as Germany’s booming job market attracts an influx of workers, putting pressure on the housing market. Average rent prices in Berlin have pushed past 10 euros per square metre per month, according to a recent study by a real estate group CBRE Berlin and German mortgage bank Berlin Hyp AG. As property prices in Berlin traditionally lag behind those of major European capitals like Paris and London, investors have also swooped in, betting that the real estate boom was only just starting. 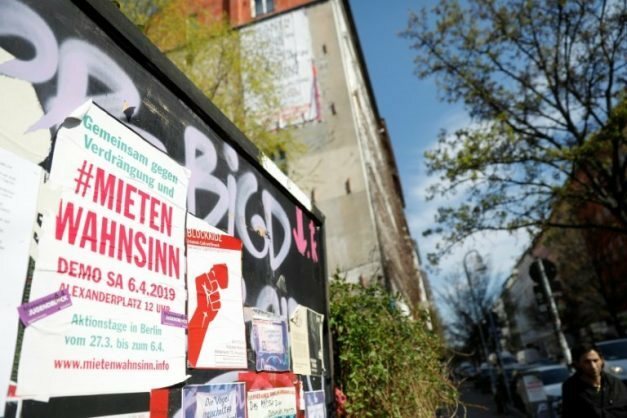 But a popular backlash appears to be growing, and organisers of an initiative to requisition housing from real estate groups will on Saturday begin collecting signatures in their push for a referendum on the issue in Berlin. The campaign’s spokesman Rouzbeh Taheri said the movement had radicalised as government measures to cool the property market have failed to work. The “Expropriate Deutsche Wohnen & Co.” initiative, named after the biggest private player in Berlin, targets companies with more than 3,000 apartments in their portfolios. Of an estimated two million rental apartments in Berlin, Deutsche Wohnen owns 111,500, followed by Vonovia with 44,000. Taheri argues that cutting them down to size would strip them of the influence they wield in deciding market prices. “It’s about sending a signal on which direction the city wants to go. And a signal to speculators — telling them that your capital is not safe in Berlin,” said Taheri. But critics question whether the private groups really wield that much influence. Calling the initiative “completely absurd”, Harald Simons, an economist at Leipzig University, noted that 70 percent of rental apartments across Germany are owned by small landlords who each hold between two and 20 apartments. Singling out the big groups would “mean that about five percent of Berlin tenants will suddenly not have to pay much while the rest would have to keep paying just as much,” he said. The extreme move could also scare off investors who want to move their businesses here and create new jobs, critics say. Further, taxpayers face a huge bill — Berlin authorities have estimated the cost at 36 billion euros ($40 billion). “When people learn about how many billions this will cost, many would see this differently,” Berlin Mayor Michael Mueller said. Deutsche Wohnen boss Michael Zahn said the organisers of the initiative were taking a “very populist tone” and warned that the public was not being given the full picture. Amid the heated debate, Franz, who suffers from depression and receives state aid, was digging her heels in. She has taken her case to the courts, arguing “hardship circumstances” under a social clause in rental laws that could halt evictions. Across town in southeastern Berlin, Hans von Maydell was also gearing up for battle, as the building he has lived in for 45 years changed ownership for the first time early this year. “The new owner … buys and sells property with money from investors who want to make the highest profits possible,” the 75-year-old said. In a pre-emptive move, he and fellow residents have sought protection under Berlin’s “Milieuschutz” rules aimed at halting gentrification. Tenants have even formed a “rental rebel” choir to belt out their protest against rising rents. For von Maydell, a roof over one’s head is as essential as drinking water and should not be “left to speculation and the free market”.